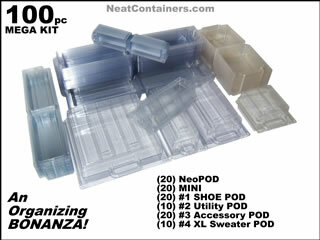 We're out of stock on our NEOPods, "MINI" pods and #2's so we are offering a swap to purchasers of this item. You may swap the out of stock items for an additional 25pc combination of the #1 or #3 Pods. (25pcs for swap, total of 75 in the package). Alternate swap offer: 5 pcs #4 and any combination of up to 15pcs #1 or #3. Please note that this is not a 1 to 1 swap as the out of stock items are far smaller. Whoa! Wait until you get this package home. Boasting a whopping 100 pieces of our award winning and patented storage containers, the MEGA kit provides for an amazing amount of organizing power! I am a Girl Scout leader and this kit would be the perfect way to organize all the craft supplies that I have on hand for the girls to create wonderful things for the community. Last night we made flags out of craft sticks for the veterans to give on Veterans Day. You don't realize what a mess popsicle sticks can be when the kids drop the box on the floor! LOL! LOVE THEM!.. thank you for your great customer service! 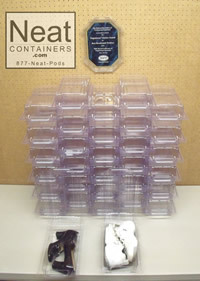 I am loving my new, organized closet thanks to the Neat Containers, and have been recommending them to my friends!!.. I am a Girl Scout leader and this kit would be the perfect w ..